The decision by the coalition forces to bomb Libya is looking more like a frustrated reaction to Libyan leader Moammar Gadhafi’s refusal to step down. The coalition was clearly disappointed that the Libya scenario in its beginning stages did not followed the Tunisian and Egyptian scenario in which both country’s leaders stepped down without a foreign military intervention. The coalition has completed hundreds of bombing sorties over Libya with minimal results, while Gadhafi continues to gain ground against the rebels. 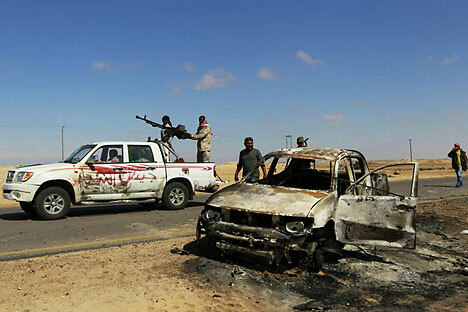 The coalition claims it has destroyed one-third of Gadhafi’s military strength, but the remaining two-thirds has apparently been enough to rout the insurgents as they retreat back to Benghazi. It is clear that the coalition’s missile strikes from bombers and destroyers are not enough to force Gadhafi out. As a result, the eventual outcome of the so-called humanitarian intervention in Libya remains uncertain. It is hard to predict how long it will continue, which forces will be employed and how it will end. What’s more, Libya’s political future is just as ambiguous. Which fraction among the hodgepodge of rebel forces will the coalition support if Gadhafi actually steps down? It has come to light that radical Islamists — including al-Qaida irregulars — have joined the fight against Gadhafi. Libyan Berbers are a third force in the struggle, and they constitute 10 percent of the population. If Gadhafi’s forces are ever defeated, the coalition will likely try to install a loyal government in Tripoli that is bent on carrying out reforms. But if that government attempts to distribute the country’s oil assets among the tribes, it will be difficult to reach a consensus. In this case, the “new” Libya would be just as bad, if not worse, than Gadhafi’s Libya and would require a more expansive intervention to stop the chaos and bloodshed that would certainly ensue. Russia has joined with the African Union in calling for a cease-fire in Libya and a peaceful political settlement of the conflict. This is a realistic option. Take, for example, Sudan, which after a series of bloody civil wars was able to reach a peace settlement this year, although it was a long and exhausting road to reach that point. As the president’s special envoy to Sudan from 2008 to March 2011, I participated directly in the country’s complex and difficult peace settlement to resolve the Darfur conflict. With the help of international organizations and peacekeepers, we reached a comprehensive peace agreement between the warring parties. A referendum was held in South Sudan in January with nearly 99 percent voting for seccession from North Sudan. An independent state in South Sudan is expected to be created in July. The Sudanese people decided their own fate, with the international community acting only as a mediator. True, that mediation process was grueling and seemingly endless, but the efforts ultimately paid off. North and South Sudan remain relatively quiet and peaceful regions of Africa to this day. Of course, the situation in Libya is changing rapidly, and it would be useless to make any predictions at this point. But the coalition forces and the global community should look at the successful peace settlement in Sudan as an example for Libya. The Arab world is changing, and Libya needs positive change toward human rights and democratic freedoms. The international community should be focusing on those goals because it is impossible to bomb a country into democracy. Mikhail Margelov is chairman of the International Affairs Committee in the Federation Council.